You are planning your big day, and trying to figure out the most cost-effective way to put everything together, so you are probably thinking that making your wedding food might be a good place to save some money. However, this is not always the case. When it comes to bringing in catering vs. making your wedding food, there are pros and cons to both options. We will discuss some of the benefits and headaches that come with making your own food and hiring a catering company so you can decide which choice works for your big day. 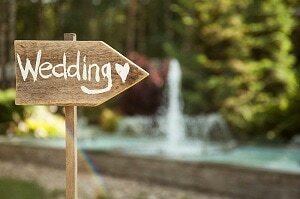 Wedding Food: Should You Hire a Caterer or Cook Yourself? Here are a few pros and cons to catering vs. making your wedding food. Making Your Own: Yes, when you design and create the wedding menu yourself, you can customize entrees without the added cost that is frequently charged by a caterer. We suggest planning your menu well in advance and making sure there are options that everyone on your guest list will enjoy. Catering: Cooking for a large group of people and tailoring the food to different tastes is not always easy. Hiring a caterer can take all of the pressure off, but you might end up with limited menu options. The downside is that because a catering company prepares all of the food for you as a service, it can be more expensive than making the food yourself. Making Your Own: Undoubtedly, setting your own schedule is an added convenience when cooking for a big event, but it can also be a difficult challenge. Coordinating cooking times and keeping the food items hot or cold can leave you stressed throughout your entire reception. Catering: Professional catering companies are used to cooking for large groups of people, they know what it takes to prepare, plate, and preserve food for the reception – and you won’t have to do anything except make sure they show up and put the food on the right table. Making Your Own: Buying multiple food items for a crowd can be a huge headache if you don’t know what you are doing. You’ll have to consider portion sizes and how much food you will need. At the event, you will not want to run out of food or have too much left over. Catering: The catering company you hire should know exactly how much food to purchase and include that in their estimate. Full disclosure: it will probably cost more than if you bought the food yourself. If convenience matters to you more than cost, catering can keep you from having to spend hours shopping for your wedding food. Making Your Own: The fact of the matter is, if you decide to make your own wedding food, you are going to be busy, and it will take a lot of work. For some, this is a welcomed challenge, while for others is an unwanted stressor. Catering: At your wedding, you want to spend as much time with the guests as possible. You do not want to be too busy or too tired to actually to enjoy the festivities of the occasion. A caterer does all the work for you, so you can spend quality time with your guests instead of worrying if your seafood pasta is cooked correctly. When you decide to prepare your wedding food yourself, you will probably need assistance. You can always ask your wedding party, relatives, or friends to help you. If you find someone you trust with the wedding food that is willing to help, by all means, create a plan with them and get to cooking. Planning a wedding is never easy. Even in the best of circumstances, it can be a stressful occasion. Weighing out the pros and cons of DIY cooking or if hiring a caterer is more beneficial should be determined at the ground stage of planning. You must know your budget and be honest with yourself about the difficulties of cooking for a large crowd. In many instances, making your own wedding food is just too overwhelming, and you are better off hiring a professional caterer. If you are looking for a wedding venue in Kansas City, contact us today for booking information! Winter might be the most romantic time of year to have your wedding and the perfect opportunity to put together an awesome reception that will knock those spring receptions out of the park. It might be cold out, but these ideas are anything but bitter. Here are some of our favorite winter wedding reception ideas. There are a ton of neat ways to incorporate fairy lights into your winter reception decor. You can hang them from the ceiling to create a delicate ambiance, or place strings around your table decor to create a warm glow. The nice thing about fairy lights is that they are subtle; you can put them anywhere and not have to worry about overwhelming guests. You probably chose to have your wedding in winter because you love the season, so why not decorate with seasonal items like cranberries, evergreen pines, and winter fauna? This can give the room a welcoming classic, comfortable look. Velvet is having a huge moment right now, and we are here for it! Choosing to add luxurious velvet to your reception decor will bring texture and warmth to tables and chairs. You can also drape large panels of velvet from the ceiling to add drama. Choose winter jewel tones like maroon, forest green, and navy blue for an interesting, on-trend look. Forget the swan ice sculptures, a popular trend for winter weddings right now is frozen flowers. We don’t mean ice sculpted into flowers-although that is also a pretty cool idea also-we are talking real flowers frozen in ice. This can be a great addition to your bar area, and we can guarantee it is something very few of your guests have ever seen before! What kind of winter wedding list would this be without mentioning faux fur? Faux fur can, of course, be worn to keep you and your wedding party warm, but it can also be used as a base for your tables’ centerpieces or draped over chairs. You can also create a lounge area at your reception with faux fur rugs and pillows to give guests a comfortable place to chat. Who doesn’t love a warm cup of hot chocolate in winter? Set up a hot chocolate bar for your guests. Keep hot chocolate warm in a crockpot and deck out the table with candy canes, cinnamon stirrers, marshmallows, Bailey’s liqueur, peppermint schnapps, and plenty of whipped cream! Setting up a s’mores station is a fun way to get guests to interact with one another. Make sure to pick up plenty of graham crackers, chocolate bars, and marshmallows. Make sure to place extra plates and napkins in this area. Click here and learn how to create a s’mores station at your reception. For information on booking The Bowery for your wedding reception, contact us today!